When dorm room or apartment shopping and crossing dorm items off of your college dorm checklist, the top dorm essential on your list is Full/Full XL dorm bedding. College dorm bedding is the most important college supply you will buy because it will help provide a quality night's sleep and is the largest dorm room decoration for your dorm room decor. Here at DormCo, you don't have to worry about sacrificing style or comfort - you can both with our great selection of Full/Full XL College Comforters! 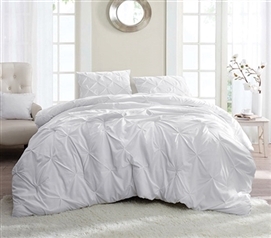 Take a look around and you're guaranteed to find an Extra Long Full College Comforter that you absolutely love! You will have your pick of a variety of styles and fabrics. 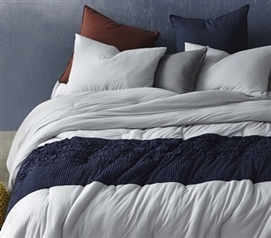 From incredibly soft Microfiber to silky soft 100% cotton and ultra warm and comfortable plush, dorm room shopping for your Full/Full XL College Comforter just got fun. Dorm decor begins with your college comforter! Add classic, impacting design elements to your dorm room decor with our Carbon Stone Full Comforter - Oversized Full XL Bedding. Here at DormCo, we take dorm bedding seriously and offer you only the best college dorm comforters. We offer a wide variety of fabrics and styles so you find exactly what you love for your dorm room decor. Making your dorm room feel like a home away from home is important to your success at college and making your dorm room feel comfortable begins with great dorm bedding and your Full/Full XL College Comforter. Sized perfectly for your university provided dorm mattress, you don't have to worry about being short sheeted. Instead you will have a consistently thick, comfortable Full/Full XL College Comforter that you will love to curl up with at night.